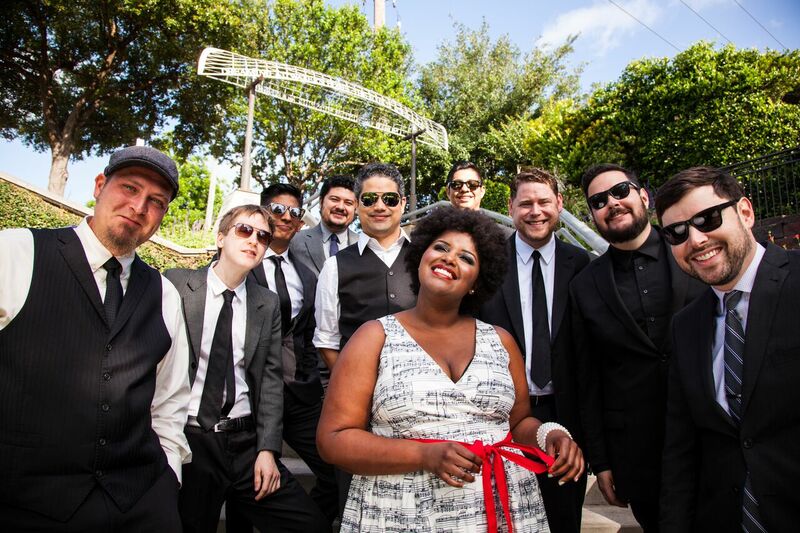 With its buttery horn arrangements, funky guitar riffs, and vocal prowess, Texas-based The Suffers open the Diana Wortham Theatre’s 2017/2018 Mainstage Series on Friday, September 22 at 8:00 p.m. with an evening of steamrolling soul. Of the band’s music, coined ‘Gulf Coast Soul,’ National Public Radio’s Tiny Desk Concert host Bob Boilen had this to say: “It’s a perfect mix of power and delicacy, as the band held back at moments, only to steamroll me when my guard was down." Shooting beyond the notion of soul revival, this outfit packs each position of the rhythm and horn section with talent and taste, providing the perfect foundation for front-woman Kam Franklin. The Suffers’ popularity has exploded in in the past two years. The band has played over 300 shows across North America, visited National Public Radio for a Tiny Desk Concert, made its national television debut on the Late Show With David Letterman, and officially released its much anticipated self-titled album. The band has been a headliner for the Austin City Limits Music Festival and enjoyed notable performances on The Daily Show with Trevor Noah and Jimmy Kimmel Live. This year the band embarks on its first international tour to spread the sweet sound of Gulf Coast Soul across the Caribbean, Western Europe, and Australia. Established in Houston in 2011, The Suffers’ lineup was curated by bassist Adam Castaneda and vocalist/keyboardist Pat Kelly. With Jon Durbin on trumpet, Michael Razo on trombone, Kevin Bernier on guitar, Jose "Chapy" Luna on percussion, and Nick Zamora on drums (plus vocals) the group boasts a powerful rhythm section that supports Kam Franklin’s soaring vocals. The Suffers progressed quickly from packing Houston venues to accepting invitations nationwide to perform at notable festivals and venues, all while remaining a Houston favorite— receiving 23 Houston Press Music Awards in the last four years. In 2015, the band received ten distinctive recognitions from “Best Live Act” and “Best Soul/Funk/R&B Act” to a number of individual awards including “Best Songwriter,” “Best Female Vocals,” "Best Drummer,” “Best Keyboards” and “Best Horn." The Suffers’ September 22 performance at the Diana Wortham Theatre is made possible by Performance Sponsors THE BLOCK Off Biltmore and Nancy Houha; and by Mainstage Music Series Sponsors Bank of America, JAG Construction, Merrill Lynch, Mosaic Realty, Signarama, Henry LaBrun, and Dianne & David Worley; with additional support from Media Sponsors The Laurel of Asheville magazine and News Radio 570 WWNC. To obtain more information on the Mainstage Series or to purchase tickets for the September 22, 2017 performance by The Suffers (Regular $35; Student $30; Child $20; Student Rush, day-of-the-show with valid I.D. $10), call the theatre’s box office at (828) 257-4530 or visit www.dwtheatre.com.